Cat Pumps new Model 6810 pump for VHP liquid systems. Ease of maintenance is guaranteed by the design of the wet end that can be serviced without the need to enter the crankcase. The plunger packings and low pressure seals are completely lubricated and cooled by the pumped liquid thereby greatly increasing service life even when pumping low viscosity and low lubricity fluids such as pure water or glycols. 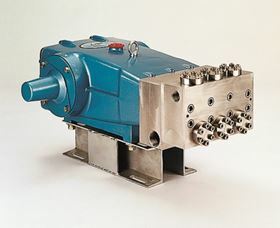 The Model 6810 addresses the challenges posed by many applications in the oil and gas sector and elsewhere, including hydrostatic pressure testing, umbilical and control line flushing, accumulator charging, chemical injection, water jetting, high pressure washdown, surface preparation and tube cleaning.